We had a very interesting meeting today, with a couple of walkers and their pig! As we drove down the (absolutely gorgeous) Oregon Coast on 101, we saw someone walking with a sign that said Walk'n Across America. 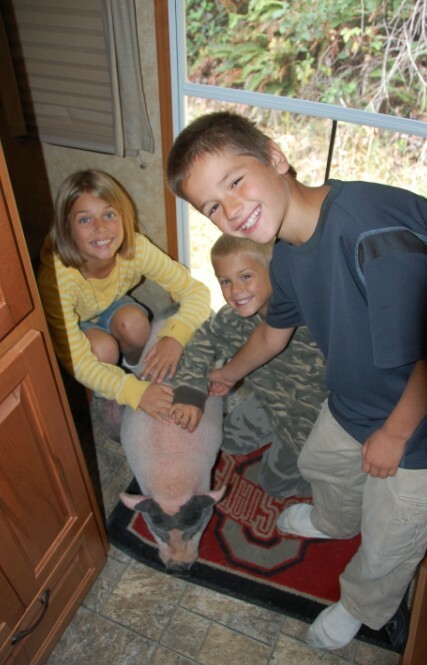 Did I mention they were pushing a pig?! We thought they had to have an interesting story! 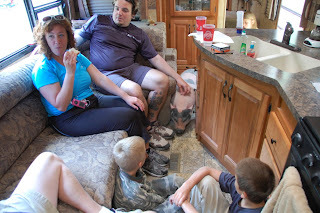 So we stopped right on the side of the road and offered them lunch and had a great time. 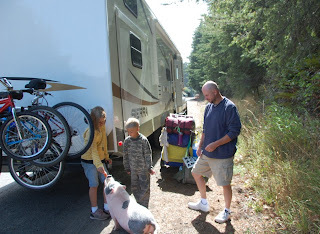 (Though looking back I feel pretty bad about offering them ham, ack!) But we had pb&j and blackberry pie (from the berries the kids picked yesterday). 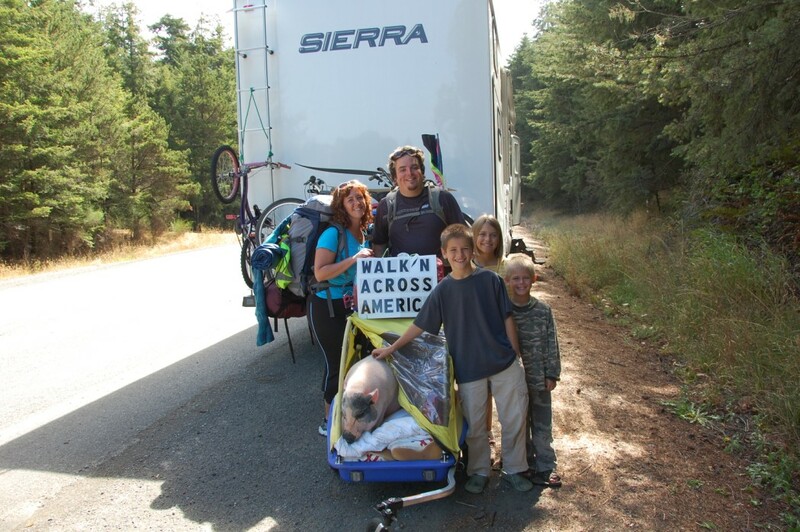 Jason and Rebecca are indeed walking across America and we had a good discussion of not waiting until later to do things, getting rid of your possessions, get out and live, what pigs eat, and the like, the things travelers love to chat about. 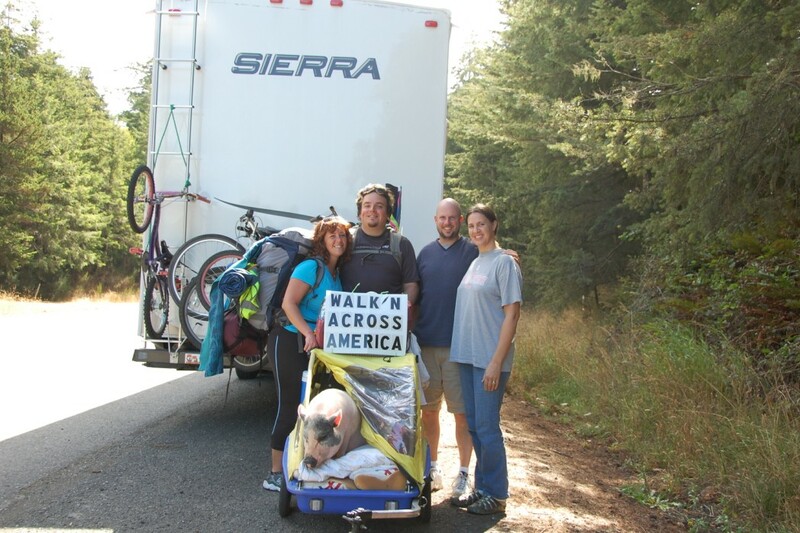 They have a passion for life and health, and we hope they have a wonderful trip! The kids LOVED Petunia (the potbelly pig). I must say she was pretty amazing. I can honestly say I've never (before today) seen a pig sit on command! 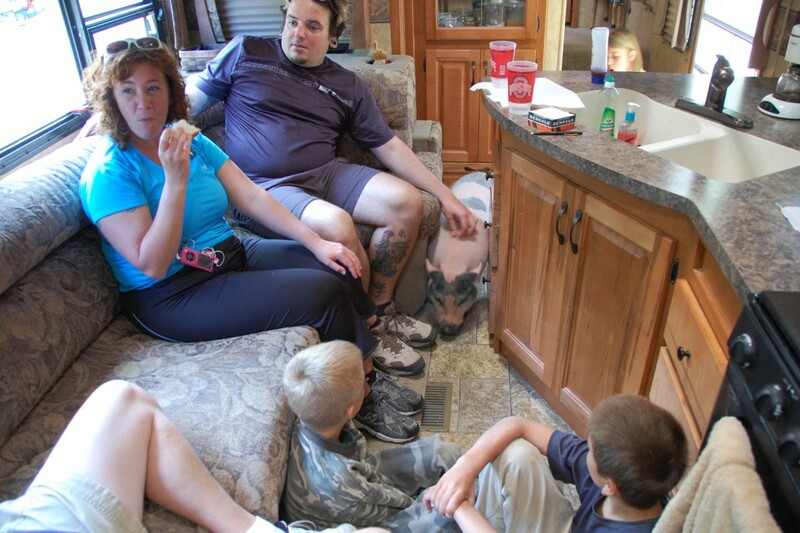 She came into the RV and the kids got to love on her and feed her carrots. She enjoys her cushy ride while Jason and Rebecca walk. We hope to run across them somewhere again one day as we travel the country! Wow,that is soooo cool! What a neat story.Love it.And they took their pig.I'd love to know the rest of the story.Where are the going? How long have they been walking and the answers to all of those questions that you all asked them.Very Cool!! Interesting,....I was just reading the walkers blog and he doesnt mention the women.Did he meet her walking across America?? Oh my word that's crazy! But I know they are getting a lot out of it; what a great experience I'm sure!